All cancers are caused by changes or faults in our genes. Some of these changes happen by chance, whilst others are caused by things like smoking or diet. Some people inherit gene changes from their parents which could put them at greater risk of cancer. Learning more about the genes involved in bowel cancer is crucial to improving diagnosis and treatment for patients. We’re involved in some groundbreaking research projects in this area already. The 100,000 genomes project, led by Genomics England, is the largest project of its kind in the world. It will decode 100,000 whole genomes (a complete set of all of a person’s genes) from around 70,000 people. The project compares a person’s healthy cells with their cancer cells to try and understand more about how cancer works. Knowing more about the building blocks of each person’s cancer means treatment and care can be tailored, this is known as ‘personalised medicine’. We are on the project’s bowel cancer steering group, with a particular focus on communication and patient and public engagement. Another major bowel cancer research project we are involved in is the Stratification in Colorectal Cancer consortium, or ‘S-CORT’ for short. The project aims to group or ‘stratify’ bowel cancer tumours based on their genetic make-up. Researchers will look at the genes involved in the cancers of over 2,000 patients. In a similar way to the 100,000 genomes project, S-CORT hopes to move bowel cancer treatment away from a ‘one size fits all’ approach, towards a more targeted and tailored step forward. 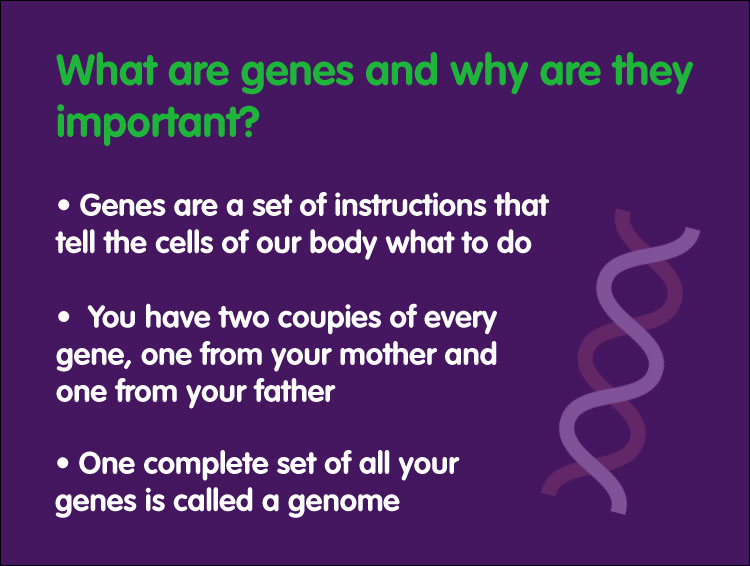 Knowing more about the genes that make up each cancer means patients can be matched to the best available treatment for them. And as well as improving treatment success, it also means many patients will be spared the toxic side effects of treatments that would never have worked for them. The genetics of bowel cancer is a crucial part of our policy and campaigning work. Having certain inherited genetic conditions, like Lynch syndrome, mean bowel cancer risk can be as high as 80%. Improving the diagnosis and care of people with Lynch syndrome is a key priority for us – we’ve made some important steps in the right direction, but urgent improvements still need to be made.